Horseracing is a great theme for online slots: it allows slots developers to delve into the Sport of Kings – the hugely popular sport that has action, racing and most importantly, betting. In fact, slots about gambling are just great. Think of online slots based around poker or casinos in Vegas and you get a real feeling for the thrill of betting. 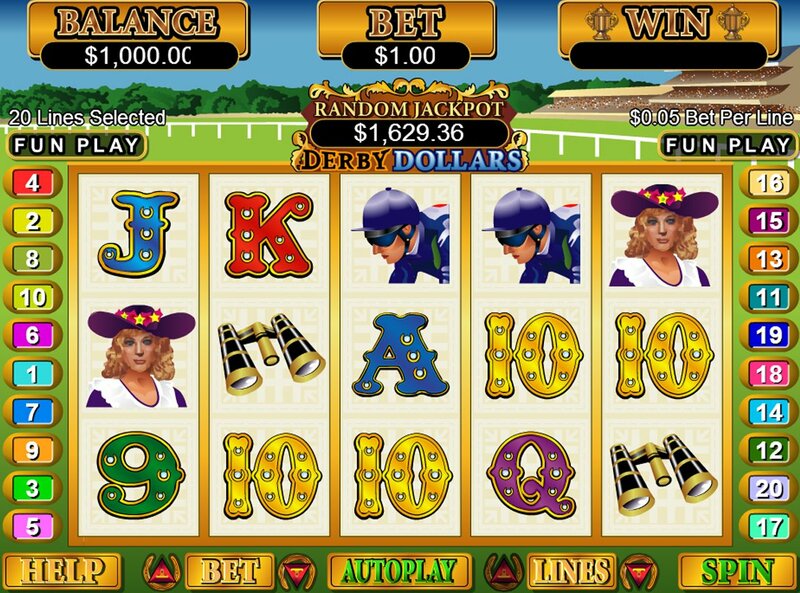 Derby Dollars, another Real Series progressive jackpot offering from slot developer Real Time Gaming, is a good example. At first glance, this slot release has everything that you could want to make a slot exciting, fun and lucrative. 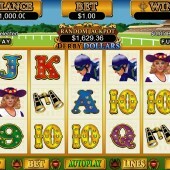 The combination of the horseracing theme, the free spins and the progressive jackpot immediately sets the juices flowing. A 5 reel, 20 pay-line slot, the game is obviously inspired by the world-famous Kentucky Derby, an annual big-bucks race in America, and has nice jackpots, even nicer progressives (awarded randomly) and a free spins round. Bets starts at just $0.01 in the game, but with a top coin bet of $5, all wallets are catered for. As well as the standard 9-through-Ace card symbols on the reels, we get lots of relevant icons on the base game screen: jockeys, horses, binoculars, trophies, and female spectators. The racehorse is the game’s Wild symbol, and it substitutes for all symbols in the game other than the Scatter to complete any winning combinations that might be available. The gold coin icon, meanwhile, is the game’s Scatter. Only two Scatters anywhere on the reels are needed in order to trigger the game’s bonus round. 5 to 25 free spins can be won, with a 3x multiplier attached to all wins. Just getting two Scatters makes triggering the freebie spins that little bit sweeter. Not only that, but additional Wilds and Scatters appear on the reels during the bonus round. As with RTG’s other Real Series slots, there’s a randomly-awarded progressive jackpot up for grabs in the game, so if the potential 50,000-coin regular jackpot doesn’t float your boat, perhaps a sweet little progressive will. If you’ve never come across NetEnt’s horseracing-themed Champion of the Track slot with its multi-layered bonus rounds, make a beeline for an online casino offering it straight away. In tone it’s very similar to Playtech's horse racing-inspired slot, Frankie Dettori's Magic Sevens, and that should also be at the top of any sports fan’s must-play list just like Derby Dollars.